The CDE curriculum is built from modules with a base of 6 ECTS, and maintaining a straight total of 30 ECTS per semester. Modules can be implemented with one or more courses, and examination / grading can be done on a class or module (recommended) level. The overall EMJMD CDE programme structure reflects the cooperation of the Higher Education partners, and is directed at supporting the key qualification objectives for a study programme which simultaneously will aim at broad-based advanced Geoinformatics, Remote Sensing, Cartography/Geovisualization, Computer Science as well as a applied emphasis on use cases with Copernicus data and services within the main Copernicus domains under a generic Digital Earth vision. A Programme Board governs all matters not under jurisdiction of individual partners (including but not limited to assignment to specialisation tracks, agreement to internship options, thesis supervision and decisions regarding summer schools). The MSc CDE programme comprises 7 modules with a total number of 72 ECTS points. 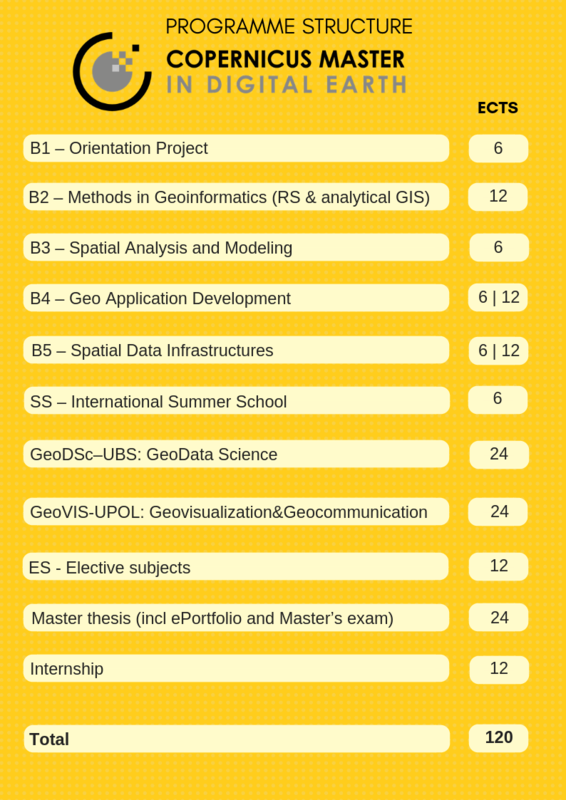 12 ECTS points assigned each for elective subjects (ES) and an obligatory internship. The master’s thesis including a research methods and academic writing module, an ePortfolio and the Master’s exam is rated 24 ECTS points. The first academic year at PLUS includes the modules B1-B5, 6 ECTS of ES with a total of 48 ECTS, plus a summer school (SS) to be completed as one from the options offered by the Programme Board. The specialization track (ST) with 24 ECTS is completed at one of the designated partner universities in semester 3, typically leading to a master’s thesis in line with the respective ST (semester 4) and co-supervised at this partner university. The obligatory internship typically is conducted in blocked mode (1 or 2 periods) outside of course (semester) periods, but also can be completed as equivalent part-time activity. Throughout the programme a personal portfolio (‘ePortfolio’) has to be maintained. It contains individual presentations of materials resulting from coursework and internships. The portfolio is developed in a suitable digital online format, e.g. as a website or blog. Development of the master’s thesis concept and development is supported by online courses on research methods and academic writing (4 ECTS total) integrated with supervision.